Are MX-5 race cars in your blood? The “Transportation Audit”, aged 5 years 10 months. I started young. The car thing is in my blood. I didn’t get it from my Dad. He doesn’t quite have the same obsession, but he’s re-learned how to fit a set of brake pads, change the oil and use a torque wrench on wheel nuts. The last bit still needs some work… I won’t mention the “wheel wobble” I experienced during a Mazda Sprint Series at Anglesey. I started young or so I’m told. When I was 5 years and 10 months, my Dad did an “official transportation audit” of my collection of toy vehicles. He’s a bit sad like that. If he can stick something into a spreadsheet, he will. 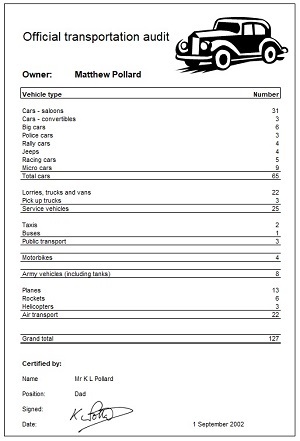 I was the proud owner of 127 vehicles according to the official record. Family holidays were “diverted” to accommodate my passion for all things automotive, and especially anything that involved drifting. Back in 2013, I convinced the family that Norway was a great place for a Summer holiday. It was more than a coincidence that the Gatebil Rutskogen drift event was taking place that week. A great event… I even got to meet pro-drifter, Ryan Tuerk, and the Speedhunters No 1 man with a camera, Larry Chen. In 2014, it was time to travel further afield… to Seattle, USA for the Formula Drift Championship at the Evergreen Speedway. and a face to face encounter with World Champion Drifter, Vaughn Gittin. I’ve managed to drag my family around the world of motorsport – the British Touring Cars Championship meetings, various drift events, Top Gear Live, AutoSport International… anything that involves something on four wheels. Eventually, I reached that important age… 18, when you can get a driving licence. Once I passed my test… things progressed from there. Take a look at my Car History. If you want to get a car to move quickly round a track, then the first step is to master the basics of car control. A full day’s “Drifting & Over Grip Limit Handling Course” under the instruction of Colin Hoad at the Millbrook Proving Ground in a Caterham 7 was the first step. Initially, I headed down the drifting route. Andy Arnott at Learn to Drift is my recommendation if drifting is your thing. 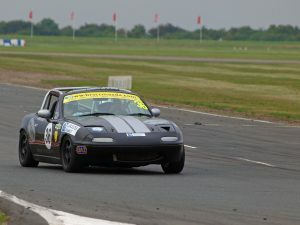 But, a car control day in our newly acquired MX-5 with MoT Trackdays at Rockingham took me down a different route. A full day on track in an MX-5 competition car, coached by Brian Chandler of BC Motorsports, convinced me that the track was the place to be.